Klein Karoo International is famous for having the finest quality ostrich plumes across the globe. World-famous stage productions, international carnivals and festivals as well as luxurious fashion houses all source their top-quality feathers from Klein Karoo. Modern sorting, sizing and warehousing facilities process an astounding 350 000kg of plumes each year. Klein Karoo International produces 70% of all exported South African feathers and related products. The feathers are put through modern mechanical dryers, where after the sorting and sizing of the plumes enable Klein Karoo to classify and grade the feathers, pooling each grade and size together for accurate calculation of price and usage. Klein Karoo International strives to empower the local community by outsourcing some of the sorting and sizing of feathers on a contractual basis, doing their part to stimulate job creation. After grading, the feathers are sent to Klein Karoo’s modern dye-house where the plumes are bleached and/or dyed into an ever-increasing range of spectacular colours. This unique process makes Klein Karoo’s feather range the international favourite for the creation of gorgeous fashion garments and trendy accessories. The feathers are ideal for interior design pieces and top-quality dusters, which include a wide range of specialized industrial, telescopic, automotive and computer dusters. 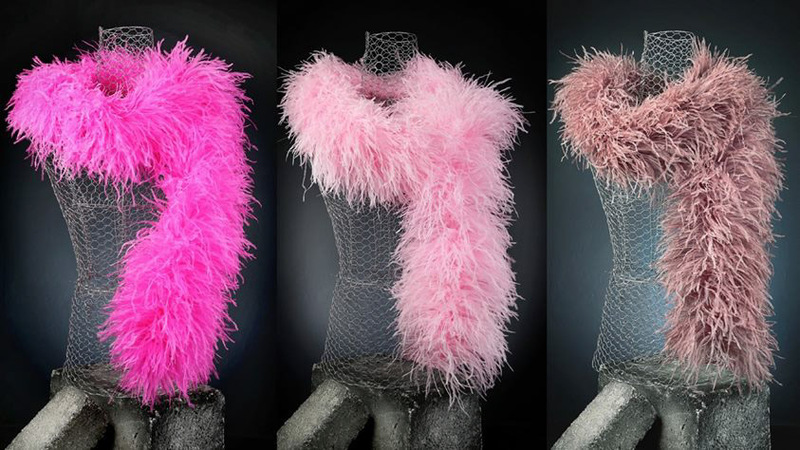 The beautiful feathers produced at Klein Karoo gets stripped and manufactured into incredible accessories that include multi-layered boas, garment fringing, feather handbags, shawls, custom designed cushions and unique gift items. 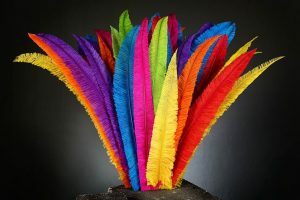 Today Ostrich feathers are probably most easily associated with the fun and extravagance of the Rio Carnival or the fantastic costumes of the Moulin Rouge in Paris… The fascination with this luxuriant plume actually started centuries ago. Evidence shows that Ostrich feathers were of great value to the people of Ancient Egypt. They graced the hair of royalty, helped souls into the afterlife and were a must-have for the elite. It comes as no surprise then, to find that Ostrich feathers have found their way into our households today and offer inspiration to fashion and fantasy designers worldwide! Thanks to 1882 – the year of the feather boom – the domestication and farming of ostriches began. Fast forward to 1903 and the sales of feathers hit an all-time high. Ostrich numbers rose to an excess of 700 000 which ultimately created the sale of £1,023,000 pounds (465,000kg) of feathers! South Africa earned over 3 million British pounds at the time and feathers were the fourth highest export – right alongside gold and diamonds. By 1945 Klein Karoo International was established, and all these years later we still supply the best quality feathers to the rest of the world. We offer many different types of feathers, of which the most highly demanded are the incomparable wing feathers. These are seen in fantasy costumes and head-dresses. They are also stripped and sewn back together as feather boas, or feather fringing, used in high fashion as well as handbags.